Valerie Concepcion on daughter Heather Fiona (left): "Kapag nag-advice siya, you wouldn't think it came from a 13-year-old teenager." 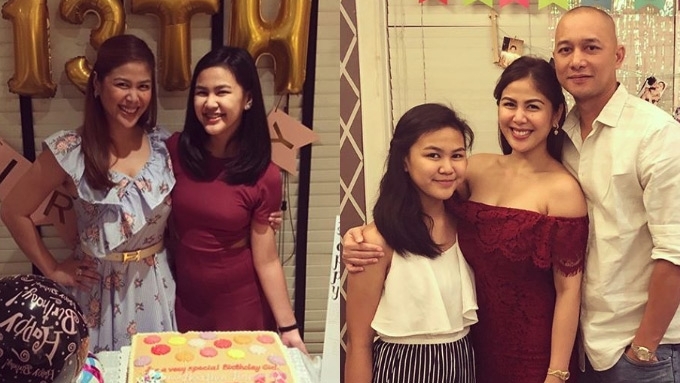 Valerie Concepcion doesn't keep any secrets from her 13-year-old daughter Heather Fiona. "Heather is like a sister to me," the GMA-7 actress-host told PEP.ph (Philippine Entertainment Portal) during a recent event. "Everything, lahat na nangyayari sa love life ko, I tell her and I also ask her opinion all the time. "And then, kapag nakikita niya ako umiiyak, siya din nagko-comfort sa akin. "For her age na 13, she’s very mature na rin and I’m so proud of her. Kapag nag-advise siya, you wouldn’t think it came from a 13-year-old teenager." Valerie has been thanking her fiancé Francis Sunga for being close to Heather Fiona. The celebrity mom continued, "Iyon lang ang something I’m thankful for with Francis. He has a daughter, too. "Meron siyang nine-year-old daughter, so kumbaga medyo marunong na siya with kids and girls. "Hindi naman sila nahirapan na mag-bonding together." Valerie has a lot to be grateful for this year. On June 20, Valerie finally fulfilled her dream of obtaining a college degree in Psychology. The Ika-5 Na Utos star graduated from Arellano University through the school's Expanded Tertiary Education, Equivalency and Accreditation Program. "Siyempre, I feel proud of myself kasi, you know, I only graduated high school when I started showbiz," the Kapuso star related. "And who would have thought that after 10 years in showbiz and 13 years old na yung anak ko makaka-graduate din ako, di ba? "Natiyagan din kasi ano iyan, e, at first when I started studying sa college, hanggang second year lang din ako dahil naging busy na din. "In God’s perfect timing, sa wakas, natuloy din! "Sobrang happy ako na finally, I have something na ipagmamalaki ko na walang makakaagaw sa akin. "Kaya ko rin naman ginawa iyon para to inspire din my daughter, para maging proud din siya sa akin..."
Another "finally" that happened in her life was getting engaged to her Guam-based Mr. Right last July 11. Valerie announced it on Instagram last August 15.